Exposure to the resin of poison ivy leaves, stems, branches, and roots causes an allergic reaction in some people. Many people get a rash from poison ivy, poison oak, and poison sumac. Poison ivy, poison oak, and poison sumac dermatitis is a contact dermatitis (type IV delayed hypersensitivity immune reaction) to an oily resin (urushiol) found on the leaves and in the stems and roots of plants of the Rhus genus (poison ivy, oak, and sumac). The very first time an individual is exposed to poison ivy urushiol oily sap, they may or may not develop a rash. Urushiol is the oil in poison ivy, oak, and sumac. You find this oil in all parts of the plants — the leaves, stems, fruits and even the roots. Within minutes of contact with urushiol, the skin starts to absorb it. But you don’t feel this. And you don’t see a rash right way. Some people are genetically programmed not to develop a rash from poison ivy. If you are predisposed to developing a rash from poison ivy, the rash usually appears between 10 and 14 days after your first exposure to the plant. A second exposure may cause a blistering skin rash to develop within 2 to 3 days after exposure to the urushiol oil. Poison ivy rash is typically seen on the extremities at sites of contact with the plant and appears as erythematous, linear plaques with associated vesicles and bullae. 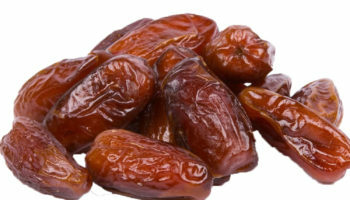 If not washed away, the resin may be easily and unwittingly transferred to other body locations, including the trunk, genital area, and face, where it will incite the same reaction. Pruritus is generally severe. Black dot (or black spot) poison ivy is the presence of black residue on the skin surface that occurs when a high concentration of urushiol contacts the skin and undergoes oxidization in the presence of moisture. Poison ivy, oak, or sumac dermatitis can occur in people of all races and ages, although the elderly and very young children may be less susceptible. Pruritus is often severe. Scratching does not spread the eruption: vesicles and plaques first appear at sites of contact with high concentrations of antigen and then, as the immune response increases, skin that has contacted lower antigen concentrations becomes involved. The contact dermatitis will persist for 3-4 weeks if not treated. Poison ivy rash can range from mild to severe, depending on how much sap gets on your skin and how sensitive you are to it. Problems can also happen if the plants are burned. Airborne sap-coated soot can get into the eyes, nose, throat and respiratory system. Note: Eastern poison ivy is typically a hairy, ropelike vine with three shiny green (or red in the fall) leaves budding from one small stem. Western poison ivy is typically a low shrub with three leaves that does not form a climbing vine. May have yellow or green flowers and white to green-yellow or amber berries. It may seem like the rash is spreading if it appears over time instead of all at once. But this is either because the plant oil is absorbed at different rates on different parts of the body or because of repeated exposure to contaminated objects or plant oil trapped under the fingernails. The poison ivy rash is not contagious and you cannot give the rash to someone else. Even if the person touches the rash or the fluids in the blisters, the person cannot get the rash. The person has to touch the oil to get the rash. 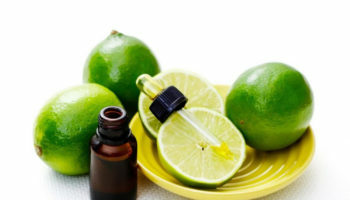 It is possible to pick up the rash from plant oil that may have stuck to clothing, pets, garden tools, and other items that have come in contact with these plants. The plant oil lingers (sometimes for years) on virtually any surface until it’s washed off with water or rubbing alcohol. Most people see the poison ivy rash go away in a few weeks. If you have a serious reaction, you need to see a doctor right away. Swelling is a sign of a serious reaction — especially swelling that makes an eye swell shut or your face to swell. The best way to avoid the poison ivy rash is to learn what the plants look like and stay away from them. If you come into contact with the plants, wash your skin and clothing right away. If you develop a rash, ask your pharmacist about over-the-counter medicines. For severe rashes, see your doctor. 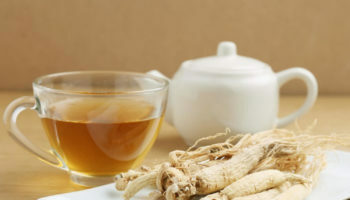 Urushiol can stick to almost anything. If you touch a pet’s fur, gardening tool, or sports equipment that has the oil on it, you can get a rash. Dogs and other animals do not get this rash. Only people get this rash. 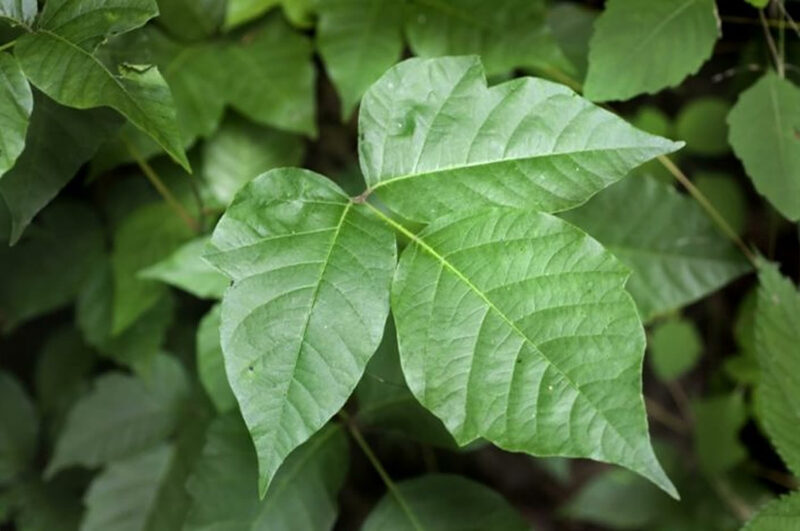 Poison ivy, poison oak, or poison sumac rashes are all reactions to the urushiol oil found on the leaves, stems, and roots of poison ivy, poison oak, and poison sumac plants. People typically have itchy bumps (papules) and blisters (vesicles). Itching can be intense, and secondary bacterial infection can result from scratching. 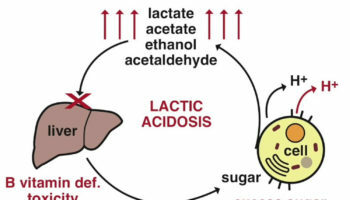 Scratching does not spread lesions; the lesions with the most antigen appear first and then, as the immune response increases, lesions with less antigen begin to erupt. Skin lesions usually begin to appear after 48 hours of initial exposure. Symptoms are usually related to severe itching. Poison ivy, poison oak, and poison sumac may affect people of all ages. Poison ivy, poison oak, and poison sumac can occur anywhere on the body where the exposure to the plants has occurred. Linear red and brown-red, raised areas and blisters are noted. Crusted lesions may be seen. Extreme facial swelling (edema) may be seen if there is significant exposure to the face. Poison ivy is a rash is also known as contact dermatitis. 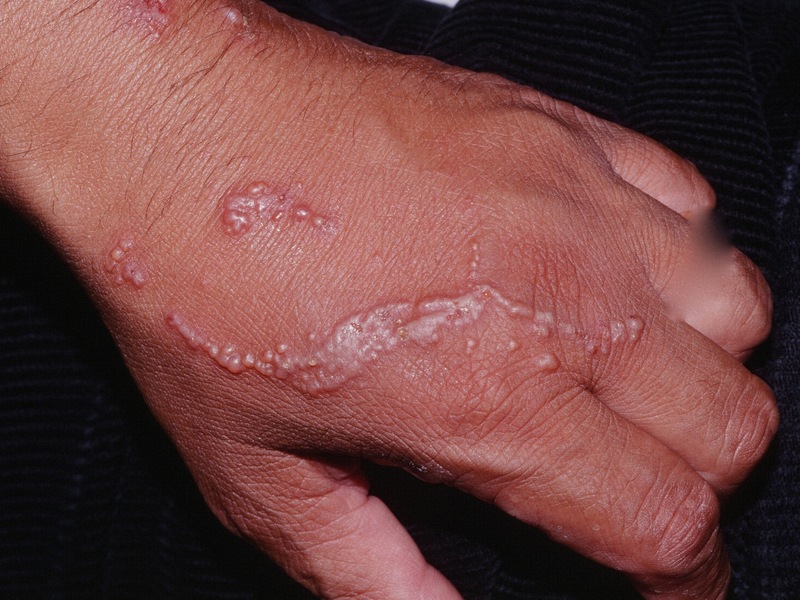 The rash can be mild or severe. It may appear right away or 1 to 2 days after contact. It is marked by redness and swelling. Small blisters may form and become itchy or painful. Try not to scratch the blisters. Bacteria from under your fingernails can get into the blisters and cause an infection. A doctor or dermatologist can usually look at the rash and tell you whether your rash is due to poison ivy, oak, or sumac. Don’t scratch the blisters. Bacteria from under your fingernails can get into them and cause an infection. Most cases of poison ivy go away on their own in 1 to 3 weeks. After about a week, the blisters should start to dry up and the rash will begin to fade. Severe cases may last longer, have worse symptoms, and cover more of your body. Applying topical over the counter (OTC) skin protectants, such as zinc acetate, zinc carbonate, zinc oxide, and calamine dry the oozing and weeping of poison ivy, poison oak, and poison sumac. Protectants such as baking soda or colloidal oatmeal relieve minor irritation and itching. Aluminum acetate is an astringent that relieves rash. If you have a serious reaction, you will likely need prescription medicine. Your doctor may prescribe a steroid ointment that you can apply to the skin. To treat a severe case, a strong medicine like prednisone may be necessary. If you have an infection, your doctor may prescribe an antibiotic. You likely have an infection if you develop a fever or have pus, pain, swelling, and warmth around the rash. 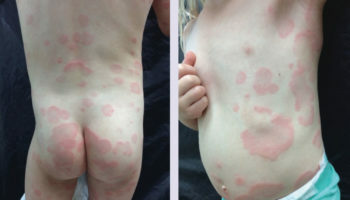 If you are not sure what caused your rash, you should see a doctor or a dermatologist. Rashes appear on the skin for many reasons. In severe cases involving large body areas, a 14–20 day course of oral steroids (prednisone). In cases with more limited skin involvement, medium- to high-potency topical steroids may be used to treat the trunk and extremities, while low-potency topical steroids may be prescribed to treat the face and skin fold areas. Oral antihistamines may be prescribed for itching. Topical or oral antibiotics may be needed if an infection is suspected.